ISLAMABAD: Former prime minister Nawaz Sharif has expressed his readiness to devise a strategy to counter horse-trading in elections, and said he is ready to work with his political rivals to discourage such practices. 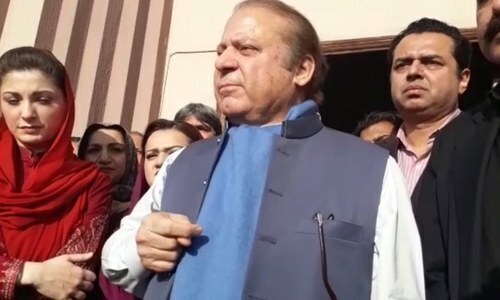 Talking to reporters after appearing in the accountability court hearing references against him on Wednesday, Mr Sharif called for an investigation into allegations of horse-trading in the recent Senate elections. He added that if all the political parties with disproportionate representation in the lower and upper houses of parliament formed a coalition against horse-trading, the Pakistan Muslim League Nawaz (PML-N) would join it. On March 3, the PML-N secured the lion’s share of the Senate seats. The Pakistan Tehreek-i-Insaf (PTI) managed to secure a seat in Punjab for Chaudhry Sarwar, but was unable to compete with the Pakistan Peoples Party (PPP) in Khyber Pakhtunkhwa. The PPP, however, emerged victorious since it bagged more seats than its current strength in terms of representation in the provinces. “We hate the concept of horse-trading and our party has never participated in any kind of horse-trading,” the former premier said. Separately, Minister of State for Information Marriyum Aurangzeb told journalists that the PML-N had not accused any party of being involved in horse-trading. However, she said that the issue must be investigated to see how political parties with 26 to 30 representatives could bag 44 votes. She said those who had switched their loyalty and were involved in horse-trading should strictly be dealt with in accordance with the law. She also criticised PTI chairman Imran Khan for not casting his vote and for showing disinterest in the legislative business. On Wednesday, four prosecution witnesses — Shahid Mehmood Malik, Waqar Ahmed, Umar Daraz and Hassan Riaz Kirmani — recorded their statements and the defence counsel completed the cross-examination of witnesses in Flagship Investments, Al-Azizia Still Mills and Hill Metal Establishment references. Mr Malik provided videos and transcripts of Mr Sharif’s address to the nation and in the National Assembly. Mr Ahmed stated that Mr Mehmood had handed them over in his presence. Mr Daraz informed the court that he had taken the summons issued for Mr Sharif to his residence in Jati Umra where a security officer, Muhammad Arif, had received them. He said that he had neither directly met Mr Sharif nor spoken to him, adding that he had not asked the security officer for an authority letter. Mr Kirmani provided details of a bank account opened in the name of Khawaja Haroon Pasha.